I'm a little late in thanking some of our bloggers from across the country. I received packages over the last couple of months, but haven't posted my proper thanks. Forgive me for not saying it sooner, but thank you. I loved everything I've received. First, I received this box of Yankees baseball cards with a few Derek Jeter cards thrown in -- for free. Life is so strange these days that I am always humbled and amazed when people do things like this. 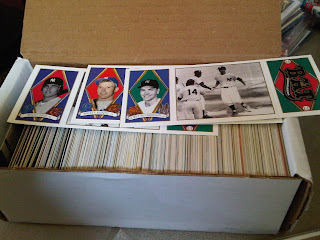 Tribecards sent this box of cards over not too long ago and paid for the shipping ($6.13) out of his own pocket. The next package came from Rod over at Padrographs. We traded two cards of Pres. Eisenhower from the 2009 Heritage set for a 2009 Jeter Spectrum card /25. He was kind enough to send over this entire case of Yankees cards, including a YSL -- if I remember correctly -- that went over to Marie. The last bubble mailer I received yesterday (or maybe the day before. My memory is shot) from Baseball Dad. He gave out a free gift for getting to 100 posts on his blog. 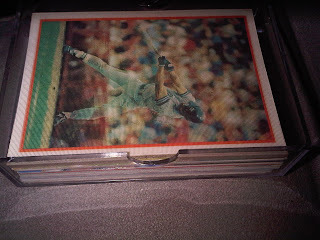 He sent over a CD compilation of baseball's greatest hits, which I will listen to in about an hour when I am heading up to the Lakewood Blueclaws, three Jeter cards I did not own and four Gabe Kapler cards. A man after my baseball heart. Again, I give a hearty thank you. But it won't be just on the blog. I will be sending out my own type of thank you.